· Adjustable modes 1 or 2, latest 2.4 GHz technology with holder for smartphone attachment. · 4 Channel Drone: All directions (up/down, forward/backward, left/right, lateral left/right, 3D turn function). · Instruction manual (cannot guarantee instructions are in English). 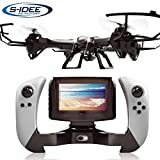 · S-idee 01608 UDI U842-1 FPV Quadcopter Drone HD Camera 4.5 Channel 2.4 GHz Enjoy your surroundings from a whole new perspective. The U842-1 FPV quadcopter retransmits a live HD video signal to the transmitter´s display. Technical description: - 4.5 channels 2.4 GHz remote control with LCD screen. - Built-in HD camera. - Resolution: 720p/30 fps. - Powerful motor for indoor and outdoor use. - 1000 mAh 7.4V Li-Po battery. - Battery warning system. - Normal and expert flight modes. - Cutout on remote control for precise flights. - Flight time is approximately 8-10 minutes. - The range is approximately 100 meters. - Charging time: approx. 60 min. - 6 propeller system to stabilize the flight. - Dimensions: 48 x 48 x 12 cm. - Live broadcast of photo and video. - Suitable from 14 years. Box contents: - S-idee U842 FPV box with HD camera. - 4.5 channels of 2.4 GHz remote control with LCD screen. - 7.4V 1000mAh LiPo battery. - USB charging cable for charging the battery. - MicroSD card + card reader. - 4 spare propellers. - Screwdriver. - Instructions in German.